Greece Beaches – 20 Best beaches in Greece! Greece is a beautiful country with lots to offer, including numerous exotic and scenic beaches. No dounbt why it is one of the most visited countries in the world! Caves, shipwrecks, natural palm groves, small turtles, white, pink and red-coloured sand – this is just a short description of the most beautiful beaches in Greece. This article will provide you with helpful information you can use while you are here. Porto Katsiki or the “Goat Port” is one of the most impressively idyllic beaches in the entire world. You can even take a boat tour for the entire day to see all of the beautiful scenery around here. It has huge towering cliffs and crystal clear blue waters. Many people who visit describe it almost like a spiritual experience. It is bound to make you fall even more in love with this country as a whole. A lot of tourists come here every day, so be prepared to deal with the crowds. The Best Beach Hotels in Greece! I made some research and found Mykonos Grand Hotel & Resort listed by The Telegraph among the best beach hotels in Greece! Elafonisi Beach in Crete is a nature reserve with some beautiful birds and sea life. It is not uncommon to see tortoises and other sea animals in the area. This beach is known for always being very clean and fairly peaceful. It is an extremely large area, so you will be able to explore a little bit to get away from all of the tourists. If you want to take a break from urban life for a bit, this is an ideal place to visit. It usually offers great surfing and scuba diving conditions as well. Koukounaries Beach is another unbelievable beautiful place to swim and just lie down on the soft sand to get a tan. It has been a protected nature reserve since the 1960s, and it attracts many people each year. If you want the perfect place to go swimming, this is most definitely it. There are pine forests in the area with trails that you can go hiking on. There is something for every nature lover here. St. Paul’s Bay is a uniquely gorgeous beach with incredible swimming, scuba diving and surfing opportunities that you’ll want to take advantage of. It is also perfect for snorkelling, if you want to gaze upon some of the beautiful sea life. One of the best things about this beach is that it is usually not all that crowded. It isn’t one of the more popular tourist areas, so you can count on it being pretty tranquil and relaxing most of the time. There are actually two beaches here that you can enjoy on a nice warm day. Lalaria Beach has huge towering cliffs that make for a rugged but idyllic landscape while you splash around in the ocean. The waves in this area make it great for surfing, so make sure to bring your board. There is numerous sea caves that you can go explore with a kayak. If you are looking for a truly memorable adventure, this place is one of the best options in all of Greece. The water is always very clear, making it perfect for scuba diving and snorkelling as well. Myrtos Beach looks like something straight out of a screen saver with its picturesque landscape and scenery. You can enjoy some breathtaking views if you are willing and able to climb up the peninsula. The turquoise waters that this beach offers are great for swimming and the sand is incredibly soft. This is one of the best places to go for a lovely sunset with your family or significant other. It is one of the most romantic spots in the area, especially around dusk. Sarakiniko Beach, Milos is known for its beautiful rugged scenery with volcanic rock and cozy little coves all over the place. It is a very peaceful place to go and swim or just lazily lie around on the sand. When you need to get away from the loud chaos of the city, this is certainly one place that you should consider. The crystal clear waters make it an astounding place for diving and snorkelling. Matala Beach is home to a number of Neolithic caves, and it has become a hot spot for tourists over the last few decades. There are numerous snack bars that you can grab something to eat at, and toilets interspersed throughout the area. This is one of the best beaches in all of Greece because of the overall idyllic scenery. It has a lot of interesting history as well. In Messinia you will find Voidokilia Beach, which also serves as a protected bird sanctuary. There are lots of beautiful avian sights to see, as well as other wildlife. If you have a strong love of nature, you will never want to leave this place. There are accounts of people occupying this beach all the way back to 4000 B.C. It has a long stretch of golden sand shore that you can walk along to take in the stunning landscape. 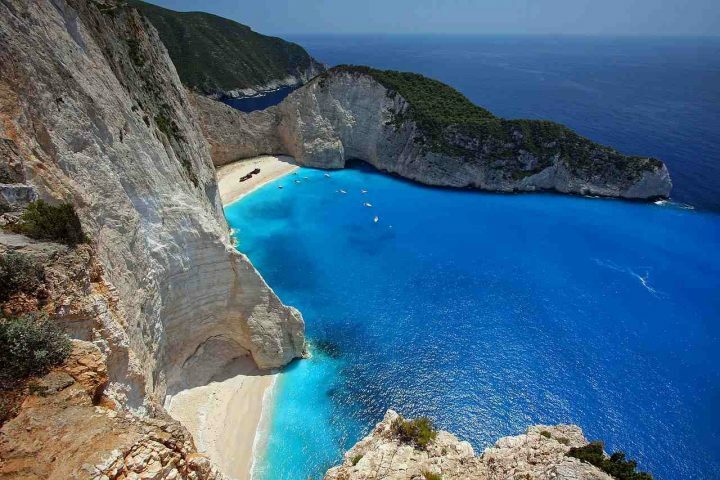 Navagio Beach is a very popular spot for tourists and photographers because of its amazing beauty. It is one of the best spots in all of the Greek Islands, and it’s not difficult to see why when you visit. The crystal clear blue water and huge rock formations make it a truly idyllic place to spend time. When you are looking for a beautiful beach to visit in Greece, you simply cannot do much better than this one. While it does get a lot of tourists, it is worth having to deal with the crowds. Diamanti Beach is truly the jewel of Skiathos, and it is very tranquil in the off-season. The busiest times are July and August, so you will need to keep that in mind when planning your trip. This beach does get a lot of tourists, but it is incredibly gorgeous. The lush and dense vegetation just adds to the unique beauty of this place. It is one of those locations where you really have to see it with your own eyes to believe that it is real. Lindos Beach in Rhodes is another place you should try to visit while in Greece. It has some extensive and interesting history attached to it that dates back to the Ottoman Empire. Many people come from all over to enjoy this beach’s natural beauty. It is a popular spot for sunbathing and a wide variety of water sports. Whether you just want to go swimming or perhaps do some scuba diving, this is the place to go. Mylopotamos Beach is well known for its crystal clear blue water and incredible scenery. The large rock formations that surround the area only add to the rugged beauty of this place. There are numerous restaurants as well as a bar that you can go for refreshments and some shade. There are numerous paths that are lined with pine trees that you can take a nice relaxing walk through. Balos Beach has a lot of charm with its white sandy shore and clear blue water. The rocky cliffs in this area make it an incredible place to spend time, especially on nice sunny days. It is a very peaceful spot that usually isn’t choked with loud and annoying tourists. This is one of the better scenic destinations for escaping the crowds and noise of the city. Xi Beach is known for its unique almost rust-colored sand. It is a little slice of paradise that attracts quite a few people each year. The water isn’t very choppy at all, making it the perfect place for swimming, snorkelling and scuba diving. You can also rent kayaks here to take out on the ocean. If you are looking for a nice laid back beach to visit in Greece, this one is worth considering. Perhaps the longest beach in Greece is the unique Laganas beach. It is home to a rare and strictly protected giant turtle. The coastal strip covered with fine sand with gradual entry into the sea stretches more than nine kilometres along the southeast coast of Zakynthos. There are some precautions on the beach at some time during the season to ensure that the small turtles are unobstructed. But which tourist wouldn’t accept them with understanding? Red Beach is the most beautiful beach of Santorini and, of course, it is a very popular tourist destination on the island. It lies below the red-stained massif on the south side of Santorini. The beach can be reached by a cruise ship or by foot from nearby Akrotiri. During your walk, you will surely enjoy the magnificent view of the entire caldera, which clearly shows the volcanic origin of the Santorini archipelago. Another very beautiful open sandy beach is Plaka Beach. It is definitely the most beautiful beach in Naxos. A few kilometres long strip of fine sand forms a popular holiday resort in the western part of Naxos Island. Here you can enjoy a comfortable walk along the sea, for example from the nearby resort of Agia Anna. The famous Canal d’Amour beach is named after a famous coastal cave with various legends. Legend has it that a woman who swims through the channel of love will forever get the heart of her chosen one. This striking natural formation with a smaller sandy beach can be admired at Sidari in the north of Corfu. And it is considered the most beautiful beach in Corfu. The most beautiful beaches in Greece certainly include the pebble beach of Tsamadou. As it is usual in Greece, even here you’ll find crystal clear sea. Tsamadou beach is located on the north side of Samos Island, about 12.5 km northwest of the capital of the same name. This part of the coast is not protected from the wind, so it is necessary to count on occasional larger waves here. A place you’ll fall in love right after your first visit – that’s Greece. 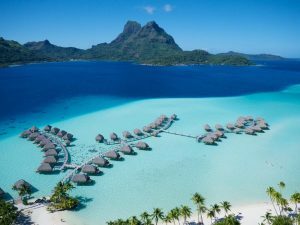 A piece of land rich in history offers some of the most beautiful beaches in the world, cordial residents, as well as the right vacation and the atmosphere you will not want to leave. Check our other article about 30 Best Places to Visit in Greece – cities, islands, mountains to find out more about this country! And once you come back from your holidays, do not forget to leave a comment below about your Greek experience! And in case any of your loved beach is missing on the list, let us know as well!